What is The Solution to Solution to Spam SMS? Spam texts are clearly a problem. Although they represent a much smaller percentage than email spam (around 3% vs 75%), mobile is a much more personal channel. Maybe one solution could come from a preference service? In the UK there is one for voice called the Telephone Preference Service (TPS). It is widely known by consumers and generally works well. It started as a voluntary scheme, but became part of the regulations. Any brand intending to conduct telemarketing in the UK must, by law, screen the numbers against the list. So why not set up something similar for SMS? The problem is that SMS is different to voice. Where as a telemarketer can phone you without prior permission, text messages are classed as ‘electronic mail’ and require the user to opt-in before a message can be sent. So for a marketer to send you a text, you must have given your permission directly or indirectly through a soft-opt in (through a sale or negotiation of a sale). Not only that, the marketer must also offer a method of opting-out of further messages. It’s therefore pointless for marketers to scan against a preference list, as users will already have opted in. A preference service won’t stop the spammers either. In the UK a majority of unsolicited messages are for accident claims, debt management or mis-sold loads or personal insurance. The people sending the texts know they are breaking the law, so they use a variety of methods to avoid discovering. One thing is certain though. They are not going to scan their lists against a preference service. In the end the only way to prevent SMS spam is a combination of better enforcement against those who are breaking the law – so far the regulators haven’t prosecuted anyone – there is much more they can do. Stopping spam also needs to be supported by better filtering at the operator level. This will stop many more messages from reaching handsets in the first place. One way to support this is through a spam reporting button (or address book entry) on every mobile handset. Even though it may be well intended, a mobile preference service is not going to solve the problem. In the end it may simply mislead consumers into believing that registering with it can somehow prevent spam messaging. It won’t. This article is to accompany a presentation given at the MobileSquared, Permission Marketing event on 3rd October 2011. We know that there are many great examples of mobile campaigns across all of the various channels. However, there are almost as many examples of poor campaigns – mobile has the ability to annoy people like no other marketing medium. 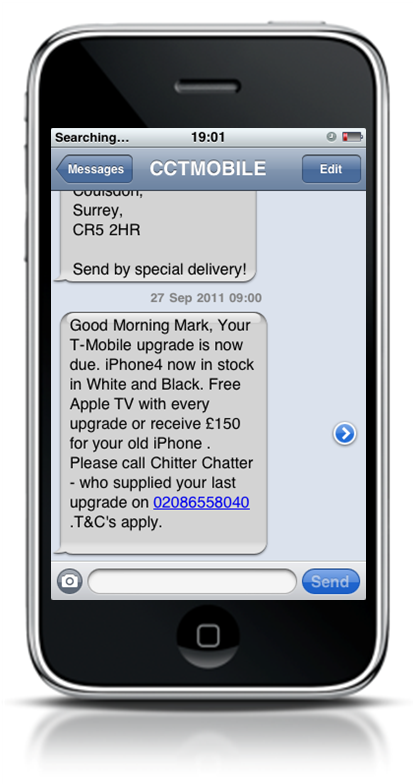 Perhaps the most sensitive channel of all is messaging – SMS and MMS. Is Spam a Problem in Mobile Messaging? Although most people are aware that spam exists in mobile, it is low-level when compared to the problem in email. However, the extent of the problem has been difficult to identify. In July 2011 the DMA conducted a survey with a weighted population sample of over 1000 people. The results were surprising to say the least. 58% of consumers had received, what they considered to be a spam message in the last month. Of these, 11% of people had received 10 or more messages during the month. We also tried to understand what consumers regarded as spam. The regulatory definition of an unsolicited message is where a consumer has not opted-in either directly or through a sale or negotiation of a sale. However, our study found that consumers took a different view. Over one fifth (22%) of the spam received was from companies where they had previously bought goods or services. It means that whilst the companies were legally entitled to send such an SMS, those receiving them, regarded them as unsolicited. The fact that it represents such a large number of message, clearly shows that there is a problem. Brands are not matching consumer expectations when it comes to permissions. There has been a problem with spam in its most obvious form over the last couple of years. We found that 42% of people had received an unsolicited message for accident claims compensation, mis-sold insurance or debt management. Such messages are quite incidious are designed to mislead the recipient. Interestingly we found that 3% of people had responded to make a claim to such a message. It shows that consumer are, understandably confused about some brand communications on their mobile phones. However, it is not just the misleading messages. In an earlier study conducted by the DMA and IAB on mobile messaging, we found that consumers didn’t trust brands when it came to their mobile phones. 71% of people were worried that signing up to a marketing campaign would result in more spam or an additional cost on their mobile phone bill. Marketers were also not meeting expectations in terms of messages. Most consumers understandably wanted offers and incentives in their mobile communications, yet most people felt they were not receiving enough of these. Another element of trust for consumers was about control over what and when they received it. 41% of people said they would be more likely to opt-in where such control was offered. So what goes into a good permission-based messaging campaign? Almost everyone in the UK is familiar with Orange Wednesdays. Most people in digital marketing know that this campaign was able to generate 15 million responses in just five years, and it continues to be successful. The scheme is an essential part of their customer retention strategy. However, understanding this success shows how a mobile message campaign could be run. The offer is simple: any Orange customer, any friend, any Wednesday, one free cinema ticket. There aren’t complex conditions about who that friend is or which Wednesday they can go. It’s universal. Redeeming the offer is also easy. Just send a message to their shortcode, 241, and you get the voucher immediately on your phone. All you have to do it to show it at the cinema and one of your tickets is free. That immediacy may seem obvious, yet there are many brands who fail to grasp this basic point and make redemption of such vouchers a long, complex matter. Whilst Orange have got that right, many brands have not. Other mobile operators are the source of frequent complaints from their customers. Too many, irrelevant messages seems to be the consensus. Whilst it is easy enough to opt-out of these campaigns, the evidence is that consumers just don’t want to receive these texts in the first place. There are millions, even billions of unsolicited emails delivered in the UK each day. It’s certainly an annoyance, yet it doesn’t seem to generate the same level of brand disapproval that unsolicited text messages do. The reason is that mobile is the most personal of communication channels. Orange have carried out an annual study, called Exposure for the last three years. They survey 2000 of their customers about how they use their mobiles and what kind of brand activity they would like. In one of their surveys asked the respondents how they saw different media channels. Television was entertaining, radio was informative. When it came to mobile, most consumers saw it as personal (and personalised). The reason is that mobile is a technology that we rarely share but where we have our most personal of conversations. In the DMA/IAB study in 2010, we measured consumer recall of brand messages. We found that 98% of people remembered what message they had received 24 hours later. The personalness of mobile means that good or bad, consumers remember brand communications on their phones. Many brands assume that a number in their database means there is permission. Consumers do not necessarily think that – there is a ‘permissions gap’. The image on the right is a good example of this. When I first received the message, my immediate thought was ‘how did they get my number’. It turns out that (via my operator) they sold me a phone 18 months ago. Although their T&Cs tell me that they opt-in everyone, the fact is that I neither recalled the company or the opt-in. To me, it is spam. Brands who have existing data need to ask themselves some key questions before embarking on campaign: how old is the data? How did they opt-in (soft or hard) and are they expecting to hear from us? It doesn’t have to be like that. Many brands have created opt-in databases by being engaging. Walkers Crisps did it by asking people to vote for their favourite flavour. Sprite/Fanta have done it by bribing teenagers with phone credit. An interesting example comes from the German pension company AMF. They got 20-something customers interested in pensions by asking them to send a picture message with their photo. A few minutes later it came back with their photo aged to 70 years. Do people want to really do that? Well, 330,000 Germans did and as a result their brand awareness went up three fold. This is a great example of personalisation. Many brands think, like the company that sent the message above, that personalisation is just a matter of adding your name. That isn’t personalisation, that’s just a mail merge. When a message is unsolicited it simply adds to the dissatisfaction. One interesting point came out with our study last year: consumers like MMS from brands. We found a 150% higher response rate than SMS. People liked the images, for sure, but what they liked the most is that it looked like the brand. An SMS can be quite anonymous. MMS created more trust through the branding and logos. Winning user permission doesn’t just have to be engaging. Delivering some (or all) of your service through mobile can be equally successful in receiving user permissions. Swiftcover, for example, were one of the first companies to do this with insurance. Airlines are using mobile for check-in. Similarly, Argos have seen considerable success with their text to take home service – over 6m people have used it with an estimated value of £30m from the resulting sales. Once you have collected some permission-based data, it’s important to engage people in the right way. Offers are important, but relevance is also key. However, with mobile, timing is everything. Obviously you can’t send messages in the middle of the night, but as mobile drives fast responses you need to carefully plan when is the best time for a particular message. Mobile is exactly what it is. Mobile. So where is as key as what and when. Targetting by location can bring some of the best response rates. Getting permissions right for messaging is fundamental to any marketing campaign. Think of SMS and MMS as the drivers for mobile. Sometimes it is the campaign, but sometimes it’s just a great way to deliver response or service as part of a wider engagement. However, once you have gained the trust of your customers through mobile, then delivering engagement through other channels is easier and more successful. After developing a successful messaging customer base, M&S were able to launch their highly successful mobile site. Much of this is about test and learn: start with a sample group and develop the campaign from there. Don’t expect everything to be successful, but respond to customers and adapt. Their mobile site is not entirely the same user base, but the key is that having understood trust and permissions of their user base they were able to include these elements in their mobile offering. For many brands, mobile campaigns are about pushing out the messages and hoping for a good enough response. They are also hoping that there are not too many opt-outs or complaints. However, brands need to think more in terms of ‘consumer pull’. Create great engaging offers or deliver service. Promote it well and learn from your mistakes. In the end, good permission-based mobile marketing is about understanding user expectations and meeting them. What’s The Future of Bulk and Premium SMS? When it comes to brand marketing, messaging still has an important role to play. When many marketers are thinking about fancy apps or mobile sites, many are overlooking the ability of SMS to drive users in a cheap and universal channel. Whilst free to user SMS is growing, premium SMS (PSMS) has a less optimistic future. channels and new payment systems are their days numbered? today, the rest of us will be doing tomorrow? channels, SMS is still the driver for brand activity. They use it because they know it works. support their service or just allow customers to engage with their brand. ago, mobile content in the form of games and ringtones was largely billed through PSMS. Apple will include contactless in their next major handset. many people are still cautious, and in the UK the BBC no longer uses premium rate services. and the UK’s Comic Relief have raised considerable sums through text-based donations. charities and most brands don’t have the same luxuries. means that PSMS has a much less optimistic future. Clearly, it’s coming from the same source as the accident claims texts. Both types of marketing message are regulated by the Ministry of Justice, who are well aware of the problem. A spokesman for the MOJ was on Radio 4’s You and Yours yesterday explaining the problem. You can listen to it on iPlayer here (the interview is 21 minutes in). He said that thousands of people had received this message. In fact, it’s probably many more than that. A few quick surveys show that up to half of everyone has got such a message. That’s millions of messages. The good news is that something is being done. As mentioned in the Radio 4 interview, they are working closely with the DMA to resolve the problem. We (the DMA that is) have created a working group which includes the regulators (MOJ, ICO), experts from the mobile marketing and telecoms industry, and mobile operators. The problem for the MOJ is that whilst dealing with the unsolicited messages are high on their priority list, they don’t have the technical resources to identify the culprits. By bringing together various industry experts, we can make it easier to identify the spammers, also look at how they got hold of the data and even take some preventative measures to stop the messages reaching the handsets. There will be updates on the progress in this blog. Click here if you want to read more about the claims texts and what to do about them. Finally, after some weeks of writing and designing, or mobile research study into Spam SMS is published. In short, it would seem that most people have a narrow permission spectrum when it comes to mobile marketing: most people are happy to get messages but only where they are offers that they have specifically asked for. However, stepping over that line means that messages may just be regarded as spam. And in the world of mobile, where things are highly personal, that means damaging the reputation of a brand. This is the latest update on my continued attempts to find the people responsible for some spam text messages. I finally phoned the company who Mblox (the mobile messaging provider) told me that they had supplied the number used for the spam replies. Apparently the company didn’t get the two emails I sent. Never mind. The guy on the phone was very helpful. He thought it was unlikely that the number/campaign was due to them, as they didn’t rent Jersey Telecom numbers from Mblox. He checked, got back to me and then got their Mblox account manager to contact me. So, in spite of 9 emails between myself and Mblox, they couldn’t give me the correct information about who they supplied the number to! The account manager was helpful, and phoned me back with details of the company that they had supplied the number to. An interesting side note was that the Mblox account manager told me that the press department had been aware of someone blogging about this. Yup, that’s me! It’s great that in this day and age with Google Alerts etc, companies can track comments and manage their online reputation. Strange thing is though, that Mblox press people didn’t contact me to tell me that I had been mis informed by their staff. If they had done so then they might have actually looked competent. I will update this blog soon, with the next installment in trying to track down the spammers.